The fentanyl strips, which would be available in one Saskatoon pharmacy, would be free to opioid users who need them. 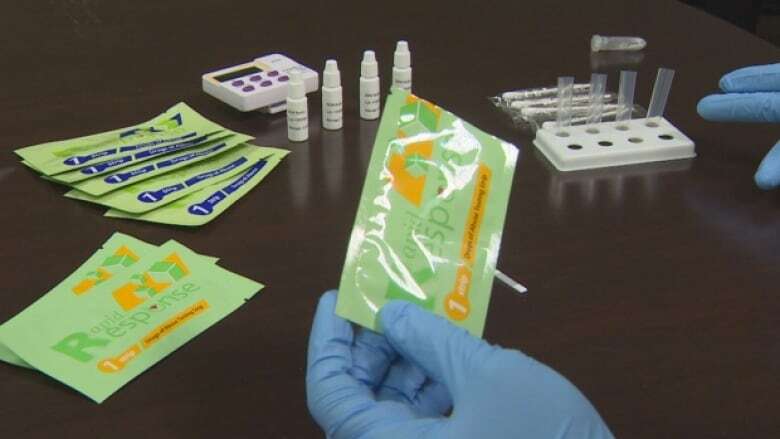 Two University of Saskatchewan students are working with a pharmacy in Saskatoon to provide the public with free fentanyl testing strips. Shayan Shirazi and Hunter Sakundiak are pharmacy students. They say the pilot project started off as a business project for school and turned into something that could actually help save lives. The strips can be used on any powder or liquid drug to help detect fentanyl or carfentanil. This can be used to prevent accidental consumption and potential overdose. "We think it can make a tremendous difference." Sakundiak said, "Even saving one life can be worth it." The testing strips are 98 per cent effective, according to Shirazi. The pair said they cannot announce which Saskatoon pharmacy they are partnered with, but that it is already involved with opioid harm reduction. Shirazi and Sakundiak say the strips cost $5, which would be covered by the pharmacy to make it free to the people who need them. They say the processes for getting fentanyl test trips would be completely confidential, but would come with an interview and counselling session. "Basically you see what the patient wants but we're not gonna project anything onto them," Sakundiak said, "We don't feel that we should be judging the patients that come in, really what the counselling is about is how to use these things and how to stay safe." The duo said 12 Canadians will die daily due to opioid overdoses, with fentanyl contributes to 78 per cent of all overdose cases. Shirazi and Sakundiak said the strips use an easy three-step process. A strip comes with a test tube and a pre-mixed solution, or "buffer," which is put into the tube. The solution is then be mixed with a small-trace amount of any liquid or powdered drug. The fentanyl test strip is then put into the mixture. The test strip will show either a negative or positive result for fentanyl within two to three minutes. Shirazi and Sakundiak said they hope to eventually see fentanyl testing strips in community centres, doctor's clinics and hospitals. "[We're] looking to get in contact with the RCMP to see if we can protect police officers when they do drug seizing," Shirazi said, "Even a minuscule grain of fentanyl can be dangerous." The pilot project is scheduled to begin in September.